Paradise Found! 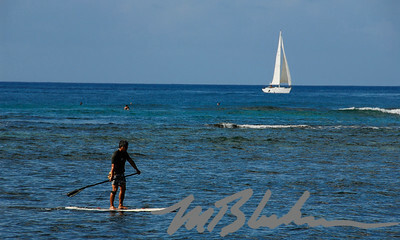 Visit Oahu, Hawaii and the North Shore through the dramatic landscapes of Michael Bluhm Photography. 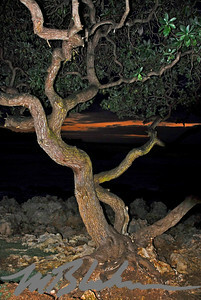 The Hau trees along the north shore of Oahu offer exotic foregrounds for many Pacific Ocean photographs. In this cropped photo, a young couple enjoy a shower at the base of Waimea Falls, a popular visitor's spot in Waimea Falls Park off the Kamehameha Highway in Oahu, Hawaii. 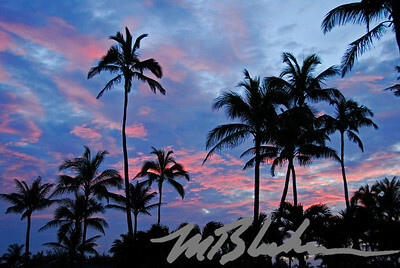 The gorgeous color of a sunset with silhouetted palms near Turtle Bay, Oahu. With crashing waves behind him, a surfer stays upright as three more surfers paddle out to take their turn. 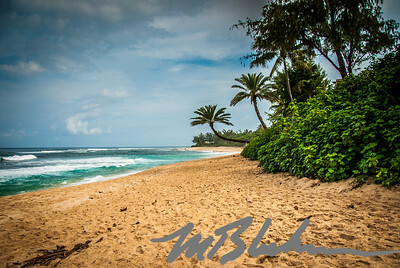 The "Pipe" is a popular surf site on Oahu's north shore and is noted for waves that can reach 20 feet in height in the winter months (November to February). 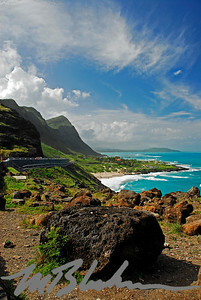 Traveling along the northern coast of Oahu, spectacular views like this one can be seen of steep mountain cliffs, lush terrain, and beautiful turquoise ocean waters. 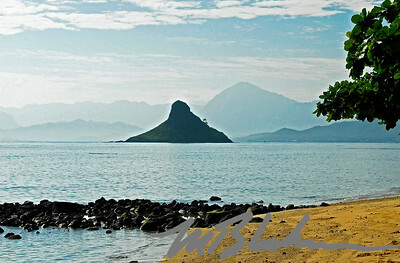 Also known as Chinaman's Hat, Mokoli'i Island is often photographed. A t low tide, you can actually walk from the beach to it 1,477 feet away! Most people pay close attention to tide schedules , or take a boat or kayak there. In the middle of this photo is a crooked palm that I have a closer shot of in this gallery. 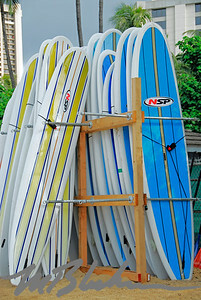 The SUP (stand-up paddle board) is a popular sport in Hawaii and other coastal states but besides leisure paddling, boards are also designed for high speed wave surfing. Because the boards can be a big as 14 feet, regular surfers don't like to be near a paddle boarder when attacking the same wave. 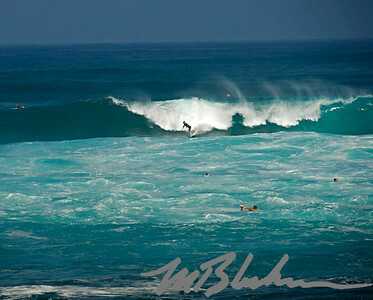 Winter is the best time to observe surfing at the Pipeline, since waves can get about 3 times as high as this one. 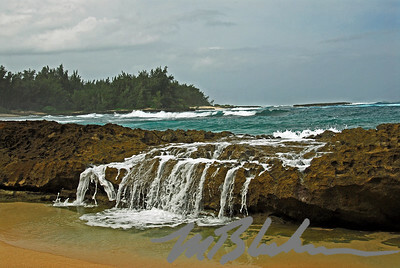 I took this photo from Turtle Bay Resort property. It's a great hotel with ocean views from every room. At night, the resort shines flood lights onto the bay so surfers can night surf! I could take photos of just the surf all day when the colors are as beautiful as this! I planned this shot the day before and determined where the sun was going to rise. 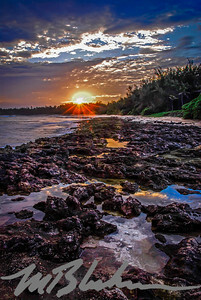 This is at Turtle Bay, Oahu. 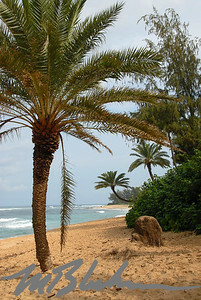 It is near Turtle Bay Resort, but in Hawaii, there are no private beaches - all are open to the public. On the island of Oahu, Hawaii, the Dole Plantation is a tourist attraction that has a gift shop, train ride, factory, garden, and lots and lots of pineapples! I took this photo of a life size wood carving by Peter Demetz. 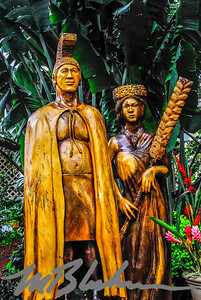 I believe it is of King Kamehameha and a female companion, maybe his queen? 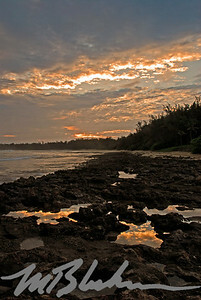 Taken after sundown on the property of Turtle Bay Resort. 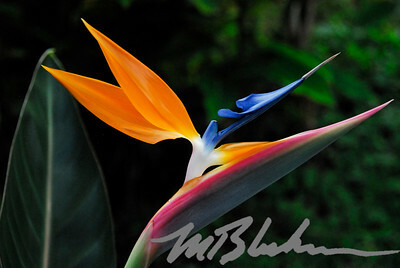 From a tour in Honolulu's Foster Botanical Gardens. 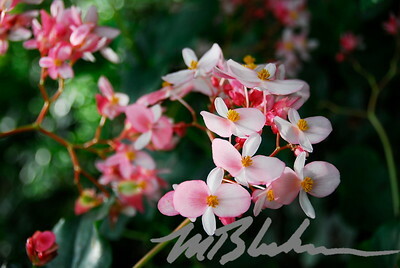 I have since tried to identify this flower but so far have failed. Anyone know? Contact me from my website! These flowers are so unique and well-named! Where trees are as beautiful as the flowers. 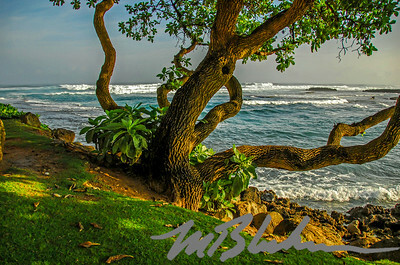 Hawaiian surf is a flowing, ever-changing art form. I could probably photograph it alone all day. The water is deep blue farther from shore and becomes a foamy turquoise near shore. In this shot, I liked the rocks jutting up like a fortress in the center. Gorgeous to look at but hard to walk on! I like the way the tidal pools reflect the colored sky. 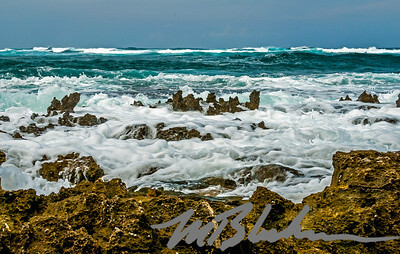 Like spilled milk, the tide flows over the volcanic rock and a high speed photo freezes the action. Maybe it's because I'm land-locked in Colorado, but I am enthralled with the ocean and the bluish-green colors it creates. 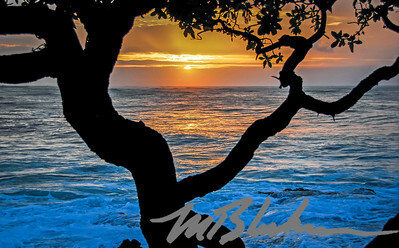 The crooked palm was used in the starting credits of the original Hawaii Five-O tv series.